Here is an editorial from the New York Sun shared with us by our friend Benyamin Korn, editor of the Jews for Sarah website who also writes at Algemeiner. “Palin Was Right” is the headline that catches our eye on the Daily Beast. It runs over an Associated Press dispatch, disclosing details of a long-ago program to prepare for an invasion of our northern territory by the Soviet Union. The AP has worked itself up into something of a swivet about this. To us the FBI looks ever more far-signed now that the Europeans are scrambling to see whether the Russians have actually invaded Ukraine and President Obama is admitting in respect of the Islamic State of Iraq and Syria that he lacks a strategy. Where is J. Edgar Hoover when we need him? He was apparently behind the program in Alaska. 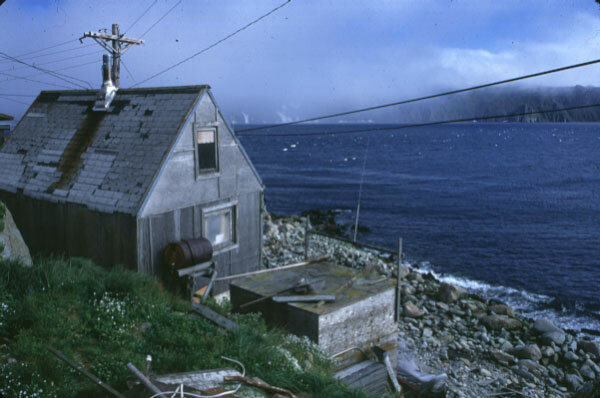 Between 1950 and 1959, the AP reports, the FBI “recruited and trained fishermen, bush pilots, trappers, and other private citizens across Alaska for a covert network to feed wartime intelligence to the military.” The idea was that when the Reds got across the Bering Straight, these agents would know of pre-placed caches of radio equipment and survival supplies and start transmitting intelligence back to our government. Smart. They could see Russia from their houses. Washtub, the AP says, reflected “genuine worry about Soviet intentions and a sense of U.S. vulnerability.” It notes that as the plan was being shaped in 1950, “Soviet-backed North Korea invaded South Korea, triggering a war on the peninsula that some in the Pentagon saw as a deliberate move by Moscow to distract Washington before invading Europe. The previous summer the Soviets stunned the world by exploding their first atomic bomb. Also in 1949, the U.S. locked arms with Western Europe to form the NATO alliance.” Plus Mao declared victory in China. In a similar vein, the editors at The Universal Spectator posted this article in May. During the 2008 POTUS election cycle then Alaska Gov. Sarah Palin, running as Sen. John McCain’s VP, referenced Russia’s very close proximity to her state (and by that, the USA), and noted how as governor who had to protect her state’s sovereignty and business interests she had to be very aware of Russia’s real and possible threats to them. However, in the left’s ugly petty ways, a ratings floundering NBC show’s bit comedy actress dressed up as the female governor and claimed “And I can see Russia from my house.” And that was the context by which the leftist MSM and others would falsely present Gov. Palin’s remarks on the matter. Even liberal-driven Snopes had to choke on this one. Recently Sarah Palin and decorated US Marine Corps war hero Dakota Meyer traveled to the area the real Gov. Sarah Palin was talking about in 2008 and took this photo shot, with Russia photo-bombing in the background. Yes. Russia and Alaska are divided by the Bering Strait, which is about 55 miles at its narrowest point. In the middle of the Bering Strait are two small, sparsely populated islands: Big Diomede, which sits in Russian territory, and Little Diomede, which is part of the United States. At their closest, these two islands are a little less than two and a half miles apart, which means that, on a clear day, you can definitely see one from the other. Given Putin’s and Russia’s recent “annexation” of Crimea, and its positioning to overtake Ukraine and low-hanging threat(s) to the EU and other territories, I would say Sarah Palin had/has a very keen sense of reality where caution and vigilance with Russia’s proximity to the U.S. border is concerned. I mean, as long as Vlad is confiscating territory he believes still belong to Russia, what’s to stop him from considering the resources rich state and its sea ports closeness to the USA and our friend Canada? After all, the guy is positioning himself and Russia militarily and economically against the world’s leaders. 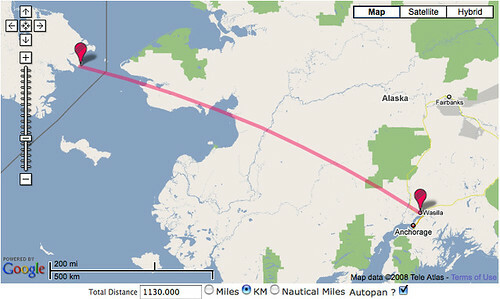 Here is a map showing the proximity of Russia to Alaska across the Bering Strait. The smaller island is the USA, the larger Island Russia. Little Diomede (Alaska) is in the foreground, Big Diomede (Russia) is in the background. Russia in the background from Alaska in the foreground. I am always amazed that some six years post our country’s 2008 presidential election there are people who still cannot differentiate between a quote from Gov. Sarah Palin and a scripted skit that was performed by Tina Fey. I’m not exactly sure what prompted Rep. Louis Gohmert to put himself out there for Gov. Palin but God bless him for doing so. Always ahead of the curve, Palin reminds of us of the importance of Alaska’s missile defense system to our national security. As former commander-in-chief of the Alaska’s National Guard, Palin is intimately aquainted with their important role in defending this country. About 30 strategic nuclear bombers and support aircraft took part in the war games that continued through June 25. The aircraft included Tu-95MS Bear H and Tu-160 Blackjack nuclear-capable bombers, along with Il-76 refueling tankers, A-50 airborne warning and control aircraft, and Su-27 and MiG-31 jet fighters. Some 200 troops also took part in the Russian Strategic Aviation forces exercise. A spokesman for the joint U.S. Northern Command and North American Aerospace Defense command in Colorado Springs, which monitors air defense intrusions, had no immediate comment. A Pentagon spokesman declined to comment.